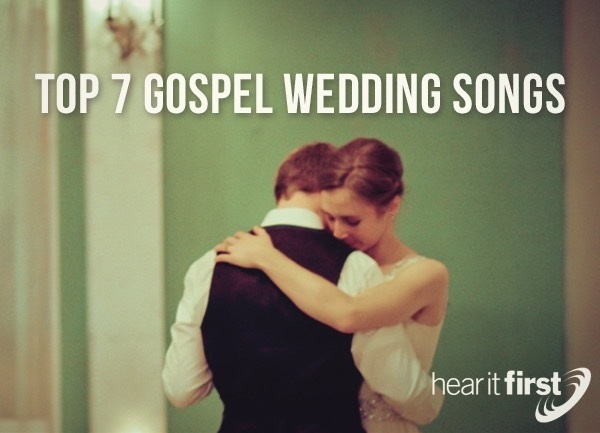 Here are seven of the top Gospel wedding songs. Leon Patillo’s song, “Flesh of My Flesh,” is perfectly suited for a wedding, or even an anniversary, because the lyrics are biblically sound, almost as if coming straight from Scripture. They sing, “You are flesh of my flesh, Bone of my bone, We are one,” and we read similar language in Genesis 2:23, which where Adam says of Eve, “This at last is bone of my bones and flesh of my flesh,” and now he leaves and cleaves; leaves his family and cleaves to his wife (Gen 2:24). That is the essence of marriage, just as Jesus said: “the two shall become one flesh. So they are no longer two but one flesh” (Mark 10:8). Mr. Patillo sings to his bride such words of encouragement, like “I pledge my life to you. Forever and always. I will take care of you.” These lyrics even sound like weddings vows. Unfailing Love, by Jimmy Needham, is a beautiful love song that also gives glory to God. Mr. Needham sings to the bride his “unfailing love for you will not be moved. For you will not be moved. My unfailing love for you,” and he understands that the “Man who devised that plan united ours with His. And so hand in hand we will walk with Him as our two become as one.” Once again, it’s very symbolic of the first marriage, in the Garden of Eden, where the Lord brought the woman to the man (Gen 2:22). God said it was not good that man be alone (Gen 2:18), meaning it must be good that Adam have a relationship. Clearly, we were created for fellowship and relationship, and partly for that reason, this song makes almost the perfect gospel wedding song, especially if the couple are believers in Christ. BeBe Winans’ powerful wedding song, “This Song,” is one that can easily be sung by the bride or the groom. It’s very easy to follow, and it has a soft sound, soothing sound feather, but the most important thing about this song is that it’s meant to be sung to a bride or a groom, and what any bride or groom wouldn’t love to have this sung to them.? This could even be performed by someone else, if not, BeBe Winans’ verse, romantically-speaking, is as good as it gets. He sings, “I felt like telling you how much I love you. No special reason, just thought you should know,” and “Thought you should know. That is was love from the start.” There is a reason that this gospel wedding song is listed in over half of the top ten lists I saw in the gospel wedding song category. You might think this song, “Order My Steps,” by the Brooklyn Tabernacle Choir, would not really be related to a wedding, but if you thought that, as I did, then we’d both be wrong because this song is actually used in weddings as the “wedding march.” It is truly a prayer in song, and what Christian couple wouldn’t seek to do what it suggests, by asking God to, “Order my steps in Your word dear Lord. Lead me, guide me every day. Please order my steps in Your word…Take charge of my thoughts both day and night,” and “Please order my steps in Your word.” What better counsel could anyone ever give to a newly wedded couple, because they “want to walk worthy, According to you will.” That will bless any marriage. What a beautiful song about a husband’s persistent and persevering love for his wife. Stephen Curtis Chapman’s song, “I Will Be Here,” is what any bride or wife would love to hear, as he sings, if “the sun does not appear. I, I will be here. If in the dark we lose sight of love. Hold my hand, and have no fear. ‘Cause I, I will be here.” And if “the future is unclear. I, I will be here.” This is a highly devotional, “death-do-you-part” kind of song that is comforts his wife by being fully committed, and is someone “who is there to stay,” no matter what comes their way, and “Our lifetimes are made for years. So, I, I will be here. We’ll be together,” forever. What song could we have included that you thought should have been on this list? It’s not easy selecting among so many that are both traditional, and relational, personal and public. It’s even harder still to find a wedding song that includes the importance of God in a marriage. When God is that third cord in a strand, it’s one that’s not as easily broken (Eccl 4:12). That family can better weather the storms that will surely come their way, because if they’ve built on the Rock, then they have the surest of foundations. Music can add such richness to one of the most beautiful of all things we do as humans; the joining of a man and woman in holy matrimony, and the two becoming one in the flesh, and it is with the hope that the parents can pass on that same kind of love they have for God and that God has for them. And because we taught them to our children and grandchildren, those lessons are really never lost.